One major pet peeve of any card-carrying, TV junkie is being asked to name their all-time favorite episode from a beloved TV show. This question is truly akin to a Sophie’s Choice. How can you pick just one when there are so many amazing episodes to choose from? So, whenever I’m faced with this groan-inducing task, I tend to counter by providing my top five. Why five? Well, frankly, three is still not enough when it comes to listing off favorite episodes and anything beyond eight tends to cause the other person to deeply regret ever asking the question in the first place. Given that this is inaugural post of TV Top Five, I’ve decided kick it off with a show that pretty much every human being on the face of the planet is familiar with… The Simpsons. To say that The Simpsons holds a special place in my heart, is a vast understatement. I, like so many other millennials, can barely remember a time when Homer, Marge, Bart, and Lisa weren’t part of our everyday cultural lexicon. Simpsons video games. T-shirts. Books. Even glassware. You name it, I’ve owned it. In short, The Simpsons isn’t just a TV show to me. No. It’s much more than that. It’s part of my DNA. So, without further ado, I present to you my top five favorite Simpsons episodes. Written by Nell Scovell, One Fish, Two Fish, Blowfish, Blue Fish is an episode that, more often than not, tends to get overlooked whenever the first five seasons of The Simpson is discussed. Sure, it’s not chalk packed with quotable one-liners, nor features a wide array of beloved secondary Simpsons character such as Milhouse or Principal Skinner. And, unlike the rest of season 2 episodes, it does tend to be a bit more somber in regards to its overall tone. But, One Fish, Two Fish, Blowfish, Blue Fish does happen to posses something so unique that it makes it stand out amongst the rest… Death by Fugu. Yes, that’s right. Good, old fugu (aka Blowfish). Who knew death by sushi was something to fear? I sure as hell didn’t. At least not until the first time I watched this episode, which happened to be at the ripe old age of eight years old. Beyond the toxic sushi, though, this episode also does a wonderful job of pulling on the audience’s heartstrings by having Homer face his own potential mortality. In quintessential Homer fashion, he has all the best intentions in the world of making the most of out of his last 24 hours, but ends up spending the bulk of it either sleeping or drunk at Moe’s. 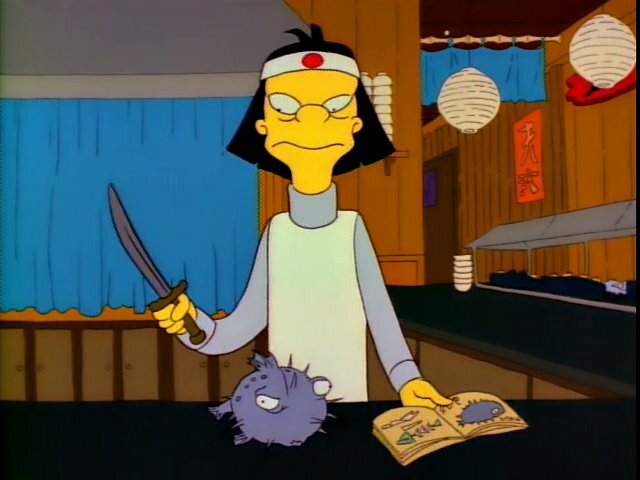 Of course, though, he doesn’t end up dying and we are left with the oh so valuable lesson that when one goes to a sushi restaurant, one should never, ever order the fugu. Roughly 30% of the phrases happened to be insanely sexist. Does this controversy sound vaguely familiar? Lisa vs Malibu Stacy is not only based off of this controversy, but is in fact, an actual commentary on how society tends to react to a brand when they make a misstep. Outraged that her new Malibu Stacy doll is saying things like “Don’t ask me, I’m just a girl” and “Thinking too much gives you wrinkles”, Lisa hunts down and convinces Lovell, the original Malibu Stacy creator, to create a new doll called Lisa Lionheart. 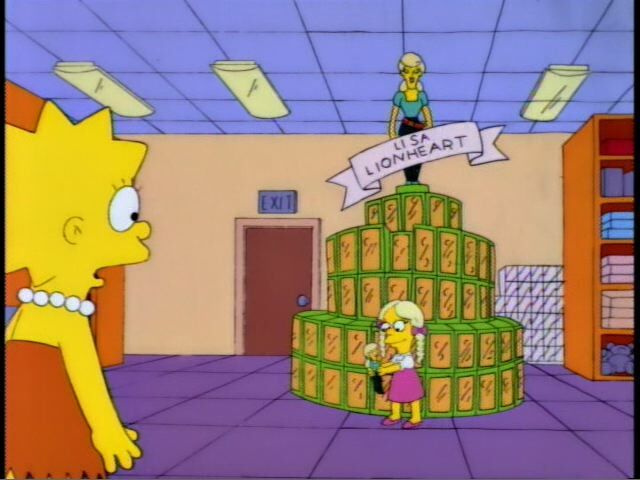 Unlike Malibu Stacy, Lisa Lionheart is smart, ambitious, and doesn’t have unrealistic body measurements. So, naturally, it should be a success, right? Sadly, just as Lisa Lionheart hits the shelves, Malibu Stacy introduces a newer version of the offensive doll with no changes except for a cheap plastic hat. Of course, the hoards of girls (plus Smithers) instantly flock towards the new Malibu Stacy instead, leaving Lisa Lionheart to become just another flop. Added bonus to this episode. It’s revealed that Smithers happens to be the world’s top collector of Malibu Stacy dolls. Shocking? No. But entertaining? Absolutely. One simply cannot have a Simpsons Top Five without at least one mention of a “Treehouse of Horror” episode. It’s a hard fast, rule. End of story. But why the first “Treehouse of Horror?” Simple. This episode is the very first appearance of two of my all-time favorite characters, Kang and Kodos. 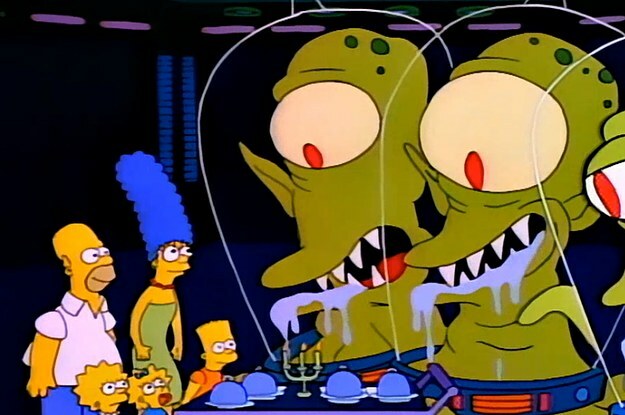 In the second vignette entitled “Hungry are the Damned”, the Simpsons find themselves randomly kidnapped by two slightly ominous looking aliens named Kang and Kodos, who plan to take them back to their home planet for a glorious feast. Lisa, the ever skeptic, doesn’t believe them and through some snooping around discovers a cookbook called “How to Cook Humans”. Which leads to a brilliantly written gag about misleading titles and well placed space dust. The vignette ends with Kang and Kodos returning the Simpsons back to their home, upset and disappointed by the family’s overall lack of blind trust and this sets the tone for future Kang and Kodos centric where they are time and time again misunderstood and disappointed by the citizens of Springfield. Although there are quite a few amazing Sideshow Bob centric episodes, they simply pale in comparison to the overall sheer genius that is Cape Feare. Named after the film Cape Fear, this episode features Sideshow Bob at his very finest. Having been locked away in a previous episode thanks to Bart, Sideshow Bob is released from jail for good behavior even though all signs point to him wanting to get revenge, including the classic Die, Bart, Die tattoo emblazoned across his chest. But of course, no believes it until it’s almost too late, which in turn, causes the Simpsons to go into the witness relocation program and adopt the ever so obvious new last name the Thompsons. But Sideshow Bob still manages to track them down, by cleverly (or not so cleverly after having to survive being dragged through a cactus field) strapping himself to the undercarriage of the Simpson’s car and kidnaps them by taking control of their houseboat. Fun fact about this episode. The infamous rake gag, which most people would agree, is one of the all-time best Simpsons jokes in the entire history of the show, was intentionally stretched out not by the writers themselves, but by the production crew in order to add time to the overall episode. It was purely luck that by doing this that it happened to make the joke even ten times funnier than originally written. Where do I ever start with this episode? There’s just so much to love about it. Homer getting food poisoning from refusing to throw away a rotting hoagie? Check. Lisa going on a pseudo acid trip after drinking water on Little Duff Gardens ride? Check. Bart discovering that, contrary to popular belief, there are in fact a plethora of people with the first name Bort? Check, check, and check. Selma’s Choice is, in my opinion, a perfect example of a quintessential Simpsons episode. It not only has some of the best one-liners ever such as “I am the Lizard Queen” and “To get to Duff Gardens, I’d ride with Satan himself.”, but it also perfectly envisions what a Disney theme park would be like if it happened to be sponsored by Anheuser-Busch. Plus, it also is the one Simpson’s episode that I can recite line by line. A life long film fanatic, writer, producer and full time wrangler of a pint-sized protege & a four-legged furball.